High Gloss out for the world to see! For those of you who haven’t seen it yet, it’s amazing! Congratulations to the entrepreneurs that started this stylish magazine. I have only been a blogger for about a month, but I continue to be blown away by the creative and stylish design bloggers and entrepreneurs out there! Whether your blog is a journal or a springboard for a business, I have truly enjoyed reading so many innovative thinkers and decorators! This has been an amazing journey so far. I applaud the art of blogging and getting creative thoughts and ideas on paper! It’s inspiring to see so many people with a passion for design! It’s also so inspiring to hear stories of people who started a blog, then turned it into a business of their dreams. Whether it’s interior designers, book writers or virtual magazine owners, the creativity of these stylish entrepreneurs is evident! These innovative thinkers have inspired me to start a blog series on virtual magazines! For the rest of this week, I will feature some amazing design mags that continue to keep me inspired! And welcome to the list, High Gloss! 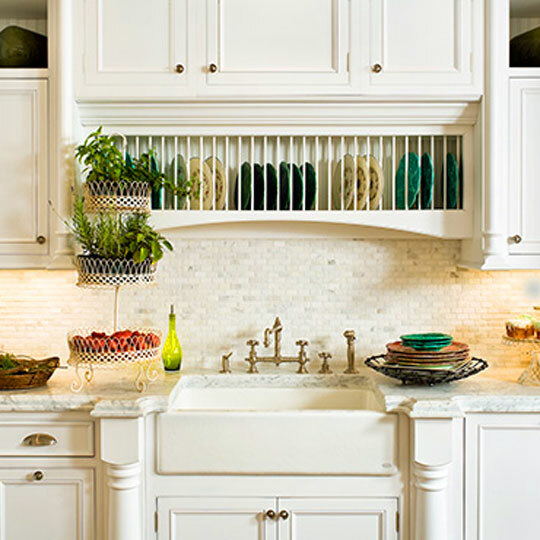 There are some kitchens that just stop me in my tracks, and this is one of them! 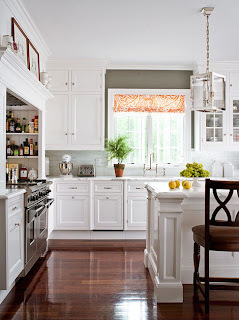 Traditional Home showcases a beautiful designer’s kitchen that I had to share with you! His name is Christopher Peacock, and his own kitchen does not disappoint. He is famous for his white kitchen designs, and he hit it out of the park for his own abode. Here are a few of the amazing photos of the space. I adore all of the white paired against dark gray walls, with a pop of orange on the drapery and pillows! Do you also love gray and orange together? When my husband and I first got married, we lived in Germany. It is there that we started to build our life together, and collected pieces to help start our design story. As newlyweds in a foreign country with hardly any furniture, we were a lucky couple! We were starting our future in beautiful, picturesque Europe, where flea markets and antique stores abound! Everywhere you look, there is history and a sense of storybook fairytale around every cobblestoned corner. I looked to this new opportunity with eyes wide open, ready to explore the adventures that were ahead. It is there that I truly became in love with interior design and decorating our own apartment! We would search european flea markets and cities to find perfect treasures for our space. It is with this search, that I began a blue and white collection. 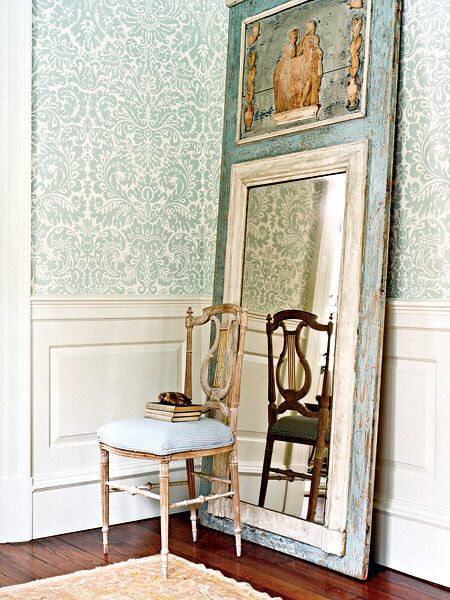 There is something about your own treasured collection that makes your space unique, personal and rich with history. The memories of the search and discovery of each collection piece are priceless. And a blue and white collection was fun, because we had so many beautiful towns, villages and cities to explore! In Germany, there were beautiful boutiques we often visited. In Poland, we stopped at several pottery shops, where shelves were lined with blue and white treasures! In the small village of Nove, Italy, we found beautiful ceramics to compliment the new collection. The search for blue and white is now fairly complete, but the memories of the hunt are always there- as we begin more collections together! Here is a sneak peek into our blue and white story. Do you have a collection, or pieces with nostalgia in your home? When I see a room that’s a jawdropper- a space that stops me in my tracks, it’s usually the lighting that is the culprit. A huge, exaggerated light fixture can bring a space to the next level. I love seeing a room with large pieces- it always makes the space feel grand. Whether it’s an oversized couch, a huge round dining table, or a giant chandelier- bigger is definitely better! 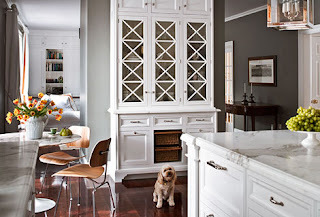 Proper use of scale can make a small space feel larger and a beautiful room stand out! When there are so many little pieces of furniture, lighting and accessories scattered around the room, the space feels cluttered and small. Here are some amazing rooms that are perfect in scale! Talk about jawdropping lighting! Love the oversized ottoman too! From Elle Decor. Photo by Vicente Wolf. Design by Vicente Wolf and David Rogul. 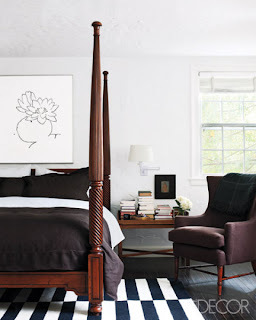 From Elle Decor. Photo by Roger Davies. From Elle Decor. Ralph Lauren’s NYC apartment. Photo by William Abranowicz. From House Beautiful. Photo by John M. Hall. 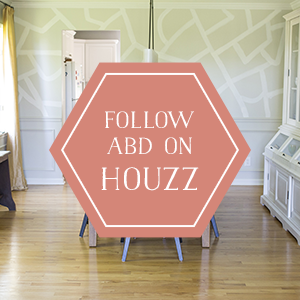 From House Beautiful. Photo by Jose Picayo. From House Beautiful. Photo by Simon Upton. Love the floors too! From House Beautiful. Photo by Victoria Pearson. From Metropolitan Home. Photo by Frans Van Der Heyden. Design by Kate Hume. Which jawdropping light is your favorite? Sometimes, your next design inspiration can come as a complete surprise. For me, it was at the supermarket. I was there today, picking up things I forgot (happens to me all the time), when I stumbled upon my next inspiration. I realized we needed tissues, because one of us always seems to have a cold in the winter. I found the cutest, most chic prints I’ve ever seen on a tissue box. (Good job, Kleenex!) I had to have these little boxes of inspiration, because I think a room could be designed around their beauty. Aren’t they fun? 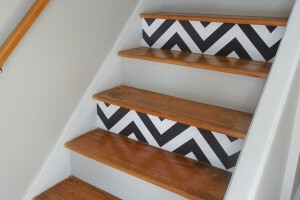 It got me thinking- what would a space look like, inspired by these prints?So, my mind starting racing, thinking about how that room could come together. The space would have to be hip and definitely very chic. It would have to be contemporary, with a splash of traditional. It must be fun and not take itself too seriously. The space would feel whimsical, light and airy. The room would have comfortable elegance with pops of amazing color! So, until this space actually comes to fruition in my own home, I thought it would be fun to find amazing dwellings where these tissue boxes could thrive! Enjoy! From Elle Decor. Photo by Simon Upton. 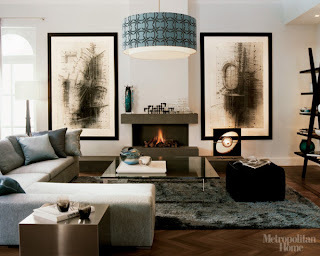 Designed by Madeline Weinrib. From Elle Decor. Photo by Simon Upton. 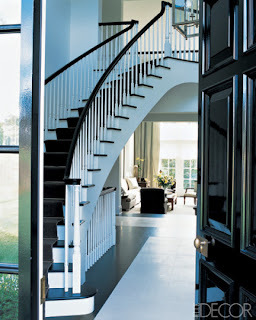 Designed by Steven Gambrel. 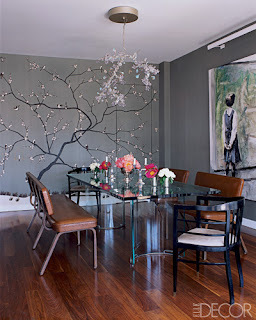 From Elle Decor. Photo by William Waldron. 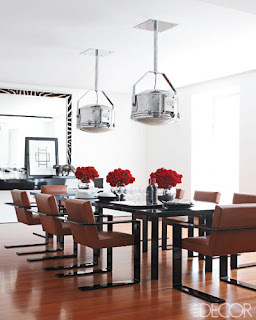 Designed by Jonathan Adler. 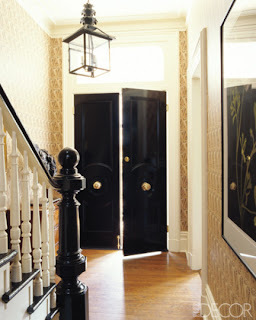 From Elle Decor. Photo by Pieter Estersohn. Designed by Gwen Driscoll. From Metropolitan Home. Photo and Design by Vicente Wolf. If you used these tissue boxes as inspiration, what would your space look like? As I mentioned in an earlier blog, My Favorite Color Palette, our living room is a work in progress. We want to collect pieces over time, to make sure that we tell our design story properly. And since I have changed my mind many times, pondering over everything from the room’s paint color to seating options, my husband and I thought it best to wait a while. The room is roughly a 14×14 space, with only one full wall- the other three walls are either filled with windows or large openings to other rooms. So, furniture placement can be a challenge. Challenges aside, I think we are off to a good start! So far, we have a few key pieces in the space that have been either found at flea markets or given to us by my mom, who also enjoys hunting for new treasures. And to mix it up a bit, there are some modern accessories and lighting. 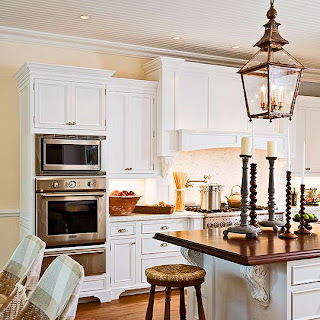 I love to blend old and new, rustic and sleek. My husband and I lived in Europe when we first got married, and we went on searches to collect unique things for our new life together. We visited the huge flea market in Tongeren, Belgium which was beautiful! So many unique treasures to find there! And one of my absolute favorites was Les Puces de Saint-Ouen in France, which is the world’s biggest flea market. Furniture, antique dress forms and collectibles lined the streets of this huge market. We also loved the small town markets in Italy that had everything from produce to furniture! So, we thought it was a great opportunity while we were in Europe, to start collecting treasures! Below are some pictures of the work in progress living room and adjoining dining space. For a more detailed description of my ideas and inspirations for this living room space, please visit an older post I wrote: My Favorite Color Palette. Here is the full wall in our living room. The antique chest was from my mom. (Thanks, mom!) Modern lighting and accessories accompany the antique. A closeup of the drum shade lamp. We have two in the space. A 1940’s mahogany secretary found in Tongeren, Belgium is also in the space. A view into the dining room from the living room. A closer peek into the dining room. 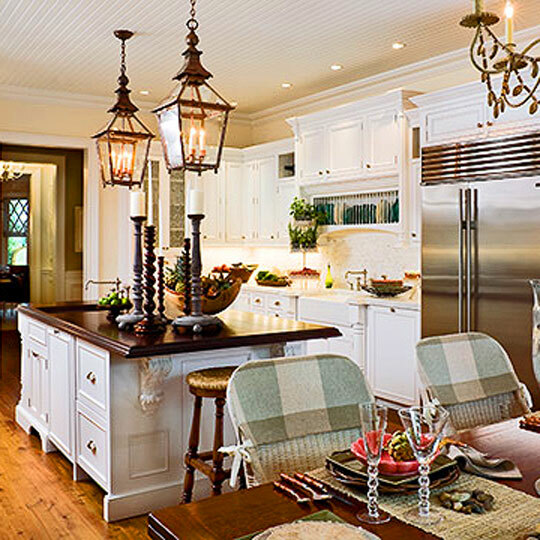 A mix of old and new, modern and traditional. We found this hutch in a store in Germany, though I don’t believe it’s an antique. A final look into the dining room, with a small peek into our kitchen. After seeing our space, what do you suggest for seating options in the living room? Aaahhhh….. the master bedroom. It can be a calming, restful retreat after a long day. A place to unwind and relax, ready to meet the next day ahead. 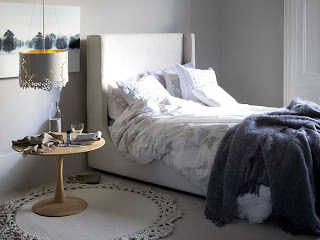 For me, I love the colors in a master bedroom to be soothing, calm and quiet- just like sleep! We currently have a four poster bed, which is great, but I have taken a liking to a new style- the tufted and padded headboard! I love to blend this traditional, romantic style with rustic, masculine touches in a bedroom retreat! I adore blending a lovely headboard and mirrored nightstands with modern, masculine drum shades and rustic wood accent pieces. I love the look of a traditional headboard paired with modern linens in blues and browns. I think it looks great when a more feminine headboard is combined with sleek armchairs in a masculine, geometric pattern. 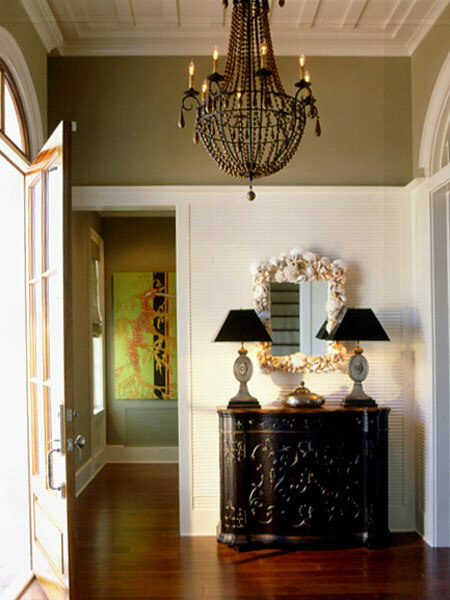 The difference can be subtle, but the play on styles and textures will make the room feel lived in and unique. I love having the master retreat neutral, without loud colors. For me, I always go back to my favorite color palette when describing my dream oasis- subtle hints of deep browns paired with ivories, blue/grays, and soft golds. The deep browns can be in some furnishings and accessories, the ivories and blue/grays are on the walls and linens, and the soft golds are in the drapes. 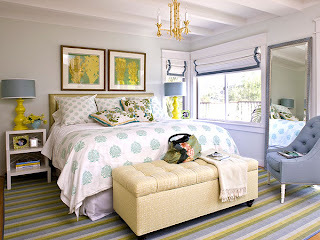 And of course, using pillows and an area rug that seamlessly blends all colors! I like adding some texture, by pairing rustic roman shades with luxurious silk drapes- again the yin and yang of modern with traditional. Aaahhhh…. the dream is lovely! Here are some inspiring master retreats- which is your favorite? 1. I love the drama in this headboard! From Cottage Living. Photo taken by Megan Thompson. 2. I also love a wing back headboard. 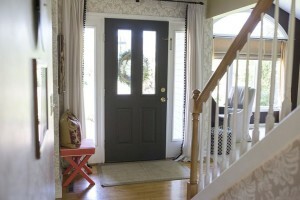 From Living etc.com. Photo taken by Paul Raeside. 3. 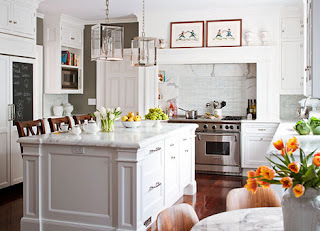 I love the subtle use of calming colors! From Coastal Living. Photo taken by Grey Crawford. 4. 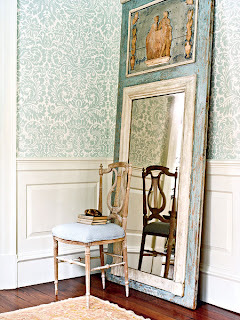 I would love these beautiful chairs as a headboard! From House Beautiful. Designed by Kay Douglass. 5. And after all my searching…… I’m also still drawn to a four poster bed! From Elle Decor. Photo taken by William Waldron. 6. It’s funny how I ended up right where I began! 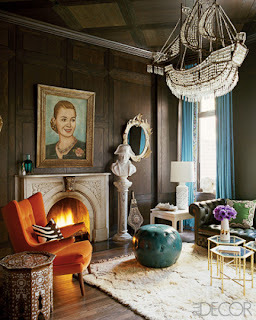 From Elle Decor. Photo and design by Vicente Wolf.